We are currently in the middle of planning our two to three month trip, and we have realized how much we will have to spend on accommodations. We will most likely be spending at least $3,000 each month on wherever we decide to stay, and that’s a scary number to think about! However, that’s not too terribly bad when you think about being able to stay in hotels for three months in a row around the world. We have found some places in the cities that we want to go to for around $50 a night (such as in Thailand or Bali! ), and other places like Hawaii are in the $200 to $500 range each night. It may be tempting to shop above your budget and see what you may be able to afford if you spent an extra amount (such as $25) each night. However, don’t do it! You might fall in love with something more that you can afford. If you are taking a trip that is less than one week long, then you might want to consider traveling during the week. Monday through Thursday almost always means cheaper accommodations than weekend stays. You might pay $100 for a Monday night room and $300 for a weekend night room. That’s a savings of a lot right there if you stay on a weekday instead. If you are thinking about springing extra for a nicer room, then you might be able to try booking a standard room and asking for a free upgrade later. What I do is that I will book a standard room and when I check in, I will ask the employee if I can get a better view or a bigger room. Usually if they have room, they will say yes! Easy as that and I don’t have to spend an extra $25 or $50 a night for a better view. Before you book online, you may want to find out what other fees the hotel may charge. There may be a parking fee and I’ve seen these go as high as $50 per night. I have also seen resort charges and these are usually around $25 or more each night. Other fees may include cleaning, internet, phone and so on. For us, we like to visit places off-season, as long as the weather is somewhat similar to what we are wanting. For example, if you want to visit the Caribbean, the weather is fairly similar year round, so whether you visit in the peak season or off season, the weather should not stop you. So, the way that I think about it is that I would prefer to visit in the shoulder or off season as it is cheaper. Another example is Alaska. Many people prefer to visit in the summer because the weather is not as cold. So, you may not want to visit Alaska in the winter if you are looking for summer weather, so you may have to splurge extra cash to visit during the peak season. 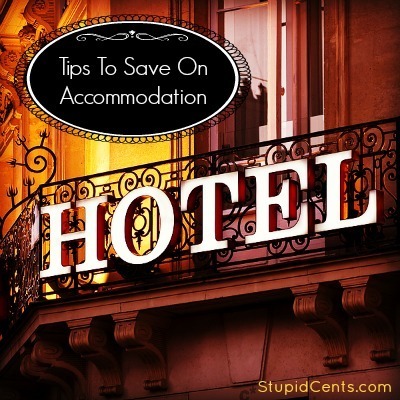 What tips do you have for saving on accommodations while traveling? We’re big proponents of using travel rewards from credit cards – we’ve been able to save huge amounts on our trips, both on flights and accommodations. In fact, we’re planning on going to Disney World for free next year thanks to our rewards!